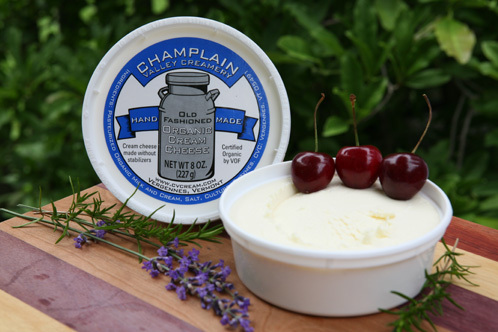 Established in 2003, Champlain Valley Creamery handcrafts certified organic cheese in Vergennes, Vermont. With a graduate degree in food science and a background in wine and hard cider making, Carleton Yoder was eager to run his own business and in Vermont, small-scale cheesemaking was a natural progression. At the start of 2010, Carleton’s wife, Moira Cook, joined the day-to-day operations making Champlain Valley Creamery a true family business. The milk for our cheese comes from a single herd of crossbred Jersey and Holstein cows in nearby Bridport, Vermont. We use traditional techniques, including moving milk in 10 gallon cans and small batch pasteurization, to produce our cheese entirely by hand. Our creamery is certified organic by Vermont Organic Farmers (VOF) and we strive to make simply delicious cheese that we hope you will enjoy. Look for our cheeses at fine retailers and restaurants throughout New England. If you are in Vergennes, stop by our creamery to catch a glimpse of cheesemaking, purchase our products, and say “hello” to Moira and Carleton. Organic Queso Anejo is our aged Mexican-style cheese. Queso Anejo starts out as Queso Fresco, our mild part-skim cheese, but it is dusted with paprika and then aged 4-7 months until a natural rind forms. When you cut into our Queso Anejo, you’ll see a layer of burnt red between the paste and rind. This is a dryer cheese that is perfect for grating and of course, cutting and eating on its own. Grate Organic Queso Anejo on Mexican dishes or substitute it anywhere you use Parmesan. 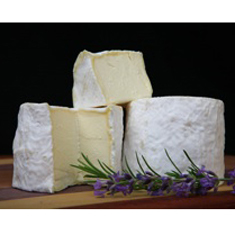 Organic Champlain Triple is a beautiful soft ripened triple crème with a bloomy white rind. Produced from cultured whole milk and cream, Champlain Triple is hand ladled into traditional crottin molds and aged approximately 10 days. It has a rich, creamy interior flavor that is offset by a delicious earthy rind with hints of mushroom. Champlain Triple is a must-have for any cheese plate. Old Fashioned Organic Cream Cheese is made without stabilizers or preservatives from cultured fresh organic cow’s milk and cream. It has a perfect balance of creaminess and tanginess that is unlike any other cream cheese you’ve tasted. It’s great on a bagel, on sandwiches, baked in your favorite dessert or simply on its own.